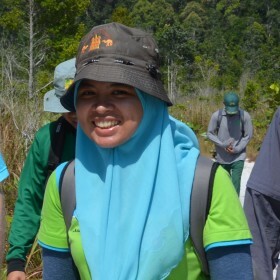 Aziah started her career with Wetlands International in September, 2013 as a Technical Officer for the Brunei office. She was involved with the Biodiversity Action Plan (BAP) project, a collaboration between Brunei Shell Petroleum (BSP) and Wetlands International (WI). The 18-month project was to develop and implement a Biodiversity Action Plan for the Brunei Shell Joint Venture (BSJV) in coastal concession area and peatlands, in particular the Badas peat dome. Apart from that are to implement the prevention and control of fire in peatlands and restoration of degraded areas. She was also part of the restoration team with Ecological Clerk of Works (ECoWs) for a Rasau 3D Seismic Survey project, which involves identification of residual impact, restoration and monitoring. Aziah graduated from the University of Brunei Darussalam with a Bachelor degree in Biological Science and a Masters degree where her research project was to identify medicinal plants used in postpartum treatment among the three ethnic groups of Brunei.